The Most Popular Dovetail Jig in America! This Dovetail Jig with unique cam-action clamping system quickly locks two boards in position to cut both tails and pins with one pass of the router. It easily handles stock from 1/2" to 1-1/4" thick in widths up to 12". The Jig has easily-adjustable knobs instead of the wing nuts found on other jigs. Simple to set up, this sturdy, well-made jig makes 1/2" half-blind dovetail joints, the hallmark of quality drawer construction. Heavy formed steel manufacturing ensures accuracy and durability. 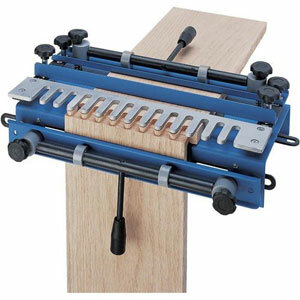 The Dovetail Jig comes with a 1/2" aluminum template and complete instructions. Jig and template are packaged in a full-color UPC-coded display box. (Listed below and sold separately).